51% of American Students Are Considered Poor -- and Most Are From These 10 States! According to the Southern Education Foundation (SEF), more than half of all American students live in households that are considered low-income or poor. According to a recent report by SEF, these students represent "students with the largest needs and usually with the least support." Where are poor students located? Most of the students who are considered poor are from southern and western states. This includes the southern states of West Virginia, Kentucky, North Carolina, Tennessee, and all states south of these states from Arkansas to Florida, and western states like California, Nevada, Utah, New Mexico, Texas and Oklahoma. These are the states that represent low-income students at a rate above the national average of 51 percent; some of these states are as high as 70 percent. Yes, the U.S. government does step in to supply free or reduced-price luncheons to children from low-income homes who qualify. But SEF makes a valid point in their report that the future of these children goes beyond feeding them. Children living in poverty often have a higher absenteeism rate or quit school all together because they have to work or care for family members. School dropout rates are 7 times higher among poor children than among children from families with higher income levels. Recently, one contributing writer for Forbes commented that the fact that 51 percent of American students live in low-income households "doesn't matter a darn." He goes on to explain why, saying "It’s not in fact a gross example of the vile inequality of the country. It’s just an example of how we’ve decided to count these numbers." 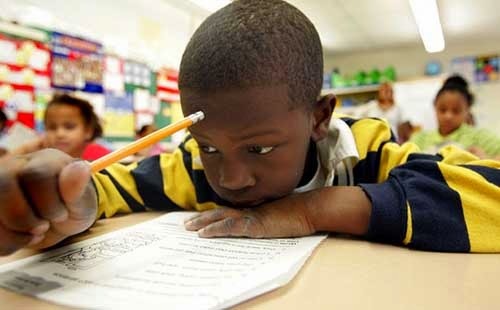 But consider this: If school dropout rates are 7 times higher among poor children than among children from families with higher income levels, and over half of American students are now living in low-income households, what does this say about the potential of our nation in the future?